Although its the oldest section of the city by far, and lies right on the lake and is bordering the downtown core, the St Lawrence neighbourhood of Toronto has never been considered premium residential property. That could be because it was once Ontario’s busiest industrial park, and when all the manufacturing jobs went overseas it became a low rise, red bricked rust belt. The region is only just coming alive again now as some new developments are set to change people’s perception of Front St East forevermore. 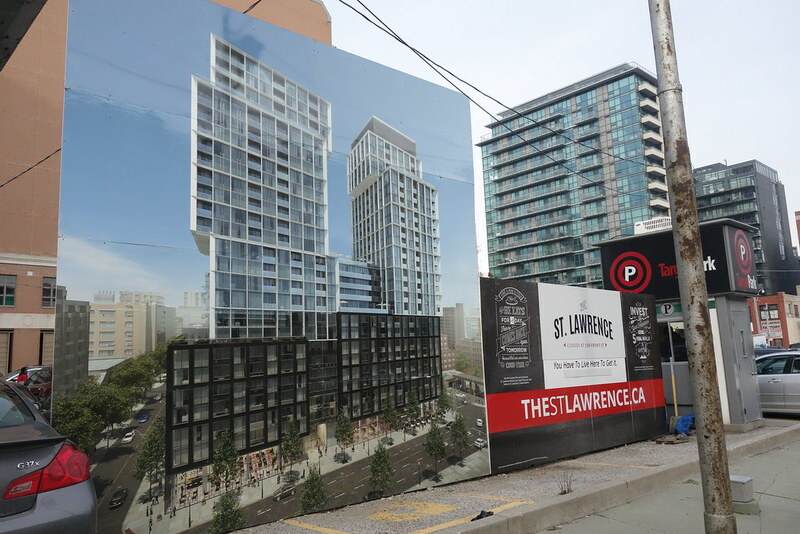 Where is the St Lawrence Neighbourhood? The St Lawrence neighbourhood is on the east side of the downtown core. It’s the oldest section of the city and as such is named St Lawrence because of the waterway that was the only conduit back to Europe for the first settlers. The district occupies the exact footprint of the first settlement of York, 1793 – 1796. 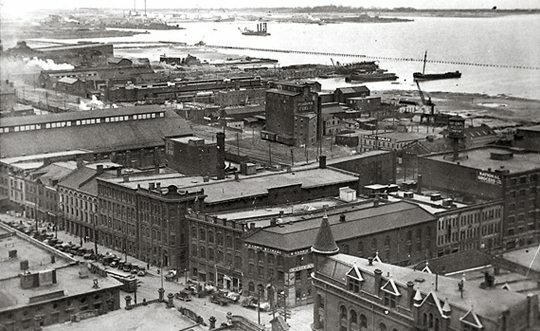 In the 1850’s, Toronto really grew fast when the railroads appeared on The Esplanade, and this area matured into one of Canada’s first and densest industrial parks. The confluence of rail transport, lake freighters bringing Pennsylvania coal (cheap energy) lumber, iron, leather and a myriad of other raw materials near cheap labor virtually assured its industrial legacy. Today the area is bounded by Yonge, Front, and Parliament Streets, and the Canadian National railway embankment. Growth typically starts at the center of any city and flows outward; the concrete towers that were just erected at Yonge and Esplanade are the harbinger of a coming transformation that will flow east down these streets and leave every property twelve to twenty stories taller. The wide patio encrusted Esplanade between Yonge and Jarvis presently boasts a half dozen or more high volume restaurants, two hotels, and a fitness gym. All this will be swept away in the next growth period. The social economic ‘lift’ will travel all long the Esplanade to Jarvis, and then east along Front to Eastern ave. The photo below, courtesy of the Toronto Archives is what King St E between Church and Jarvis looked like in the thirties. Readers can pinpoint the top of the Flatiron Building in the bottom right corner of the frame and the long single row of skylights across the top of the St Lawrence market building on the middle left hand side. Behind this center block of businesses, the rest of the neighbourhood is an industrial wasteland. During the Great Depression, Toronto’s crime hardened ‘lower east side’ was referred to as St. Lawrence Ward. Today its known as St. Lawrence Market because of the historic vendors’ market which has survived as its primary focal point. The Esplanade was initially conceived as beautification project for the lake shore the 1840s, and there have been many attempts to clean up Toronto’s waterfront since then. In the 1970s, the Esplanade was the site of a large city-sponsored housing project. Led by Mayor David Crombie, the leading architects and developers of the day revitalized the land here, described then as ‘brownfields’. 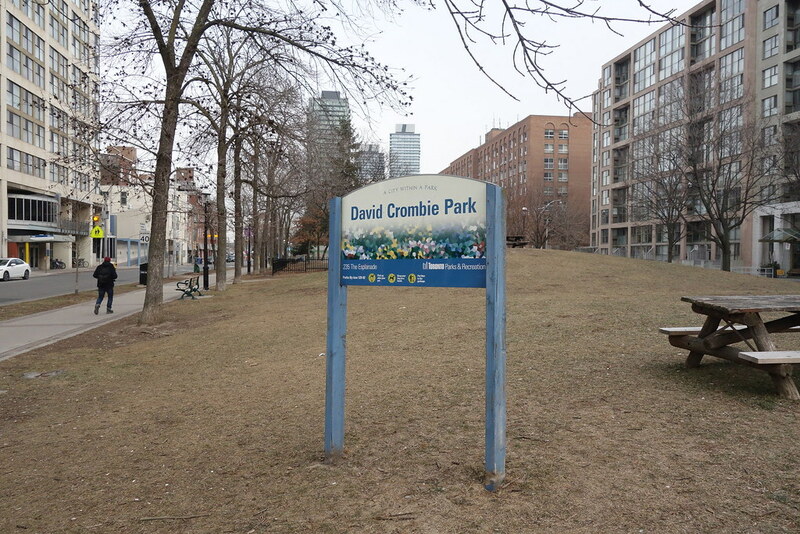 Mayor Crombie was enormously popular (he also stopped the demolition and redevelopment of Kensington market), and so its not surprising that councilors elected to put his name on the new park signs. If you dwell in the area as a tenant today, you should probably move. Consider subletting your space for the next three years. Life on these streets is going to going to be loud, dirty and congested, especially on Front St from Jarvis to Princess as no less than three different condominium developers are set to build in 2017. 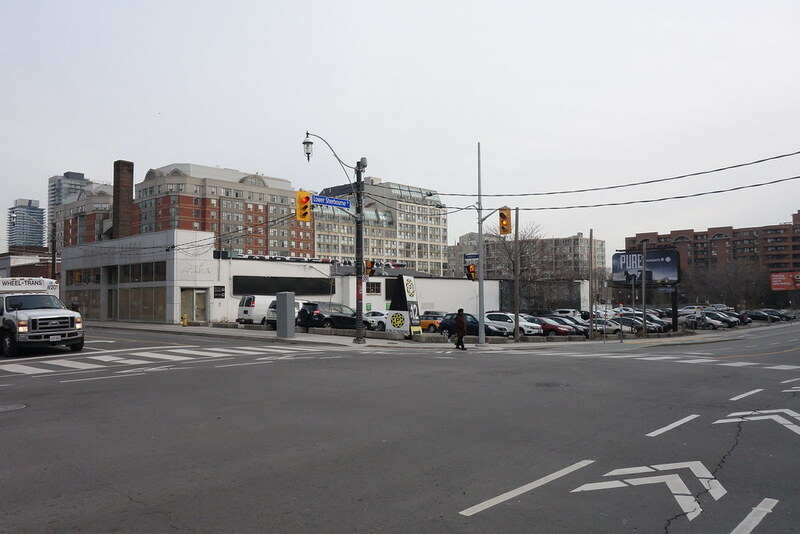 The St Lawrence Market itself, the north building, is the site of a new ninety million dollar four – story mega-mall attraction that’s sure to bung up traffic below for the best part of the next century. Professional archeologists are now publishing accounts of their digs in the areas, and the public is already wealthier because of their work. 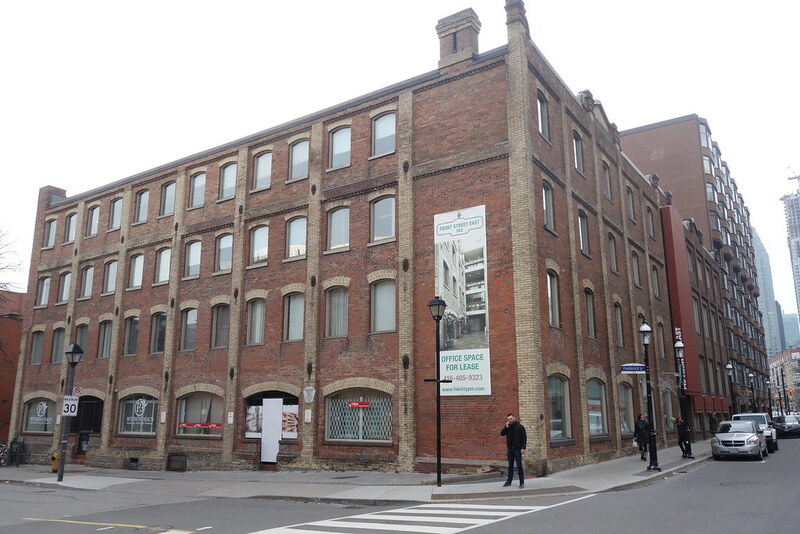 There’s a professional archeologist’s report for 154 Front St E (pdf) online which inspired a terrific time-travel story on Time and Space Condos 177 Front St E website that excites the imagination of readers. 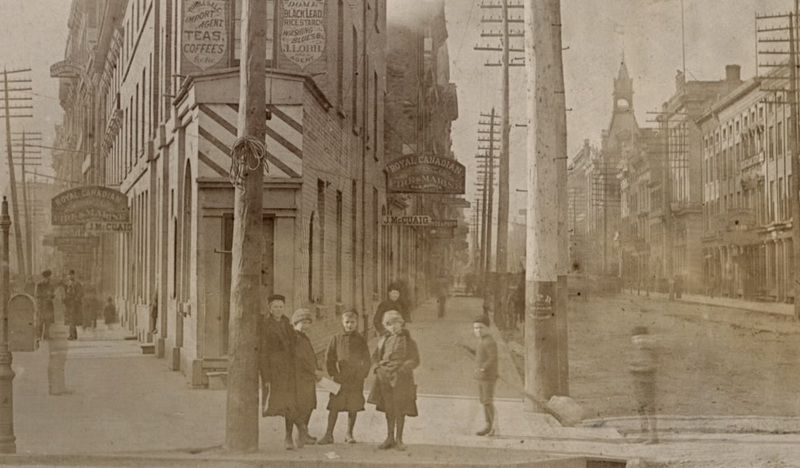 A slightly derivative post on Toronto Guardian shows the history of all four corners of Front and Sherbourne. In the Toronto Star, John Lorinc’s January 7th 2017 piece on the History of the St Lawrence Market contains a comprehensive account of the centuries old market area with pictures and descriptions detailing how the buildings looked over the years, and the many different types of businesses that operated there. Lorinc interviewed the archeologists at their dig site and showed some of the material they’ve unearthed. The piece tracks the north and south buildings back through the years and even describes how the market affected the surrounding neighborhood. John Lorimc started the Toronto Star article with an assertion that the first settlers somehow ‘decided’ where the St Lawrence market would be situated. Reflecting on this, I imagine it rather evolved from existing beach front commerce – it is after all called the St Lawrence market, not the York Market. Woodsmen and other pioneers living outside the perimeter would have been selling fish and water fowl (which was plentiful by all accounts) even as the first British colonists landed and cleared the trees for settlement. Townspeople trading with natives, and American ships crossing the lake would bring goods to trade and they would need space to store and display their wares. They’d seek or build shade in the summer, and shelter from wind and rain in all seasons. This author believes the first market was built by many hands over time. Indeed, Lorinc’s article records that a contemporary report in 1820’s describes the first building as a ‘shambles’, which entirely supports the notion that it was build incongruously by many separate mercantile interests. The hypothesis invalidates the well known artist’s rendition of the market in 1803, as seen above. The structure depicted in the sketch is far too symmetrical in appearance to have been built as I imagine, more hodge-podge and without any real planing. This author believes Front Street East will soon be ranked among the trendiest streets in town and take its place beside Bloor, Queen, College and King as a premier neighbourhood thoroughfare. When the dust finally settles from the condo building constructions at 158 Front E and 177 Front St E, the area will have added over 3600 new residences that could accommodate over 10,000 new residents. Historic buildings like the Davies pork packing plant above and the Young People’s Theatre building will also be caught in the upsurge. They’ll be bought or leased entirely by single businesses, probably tech companies and repainted in such a way to celebrate their legacy and leverage their permanence. 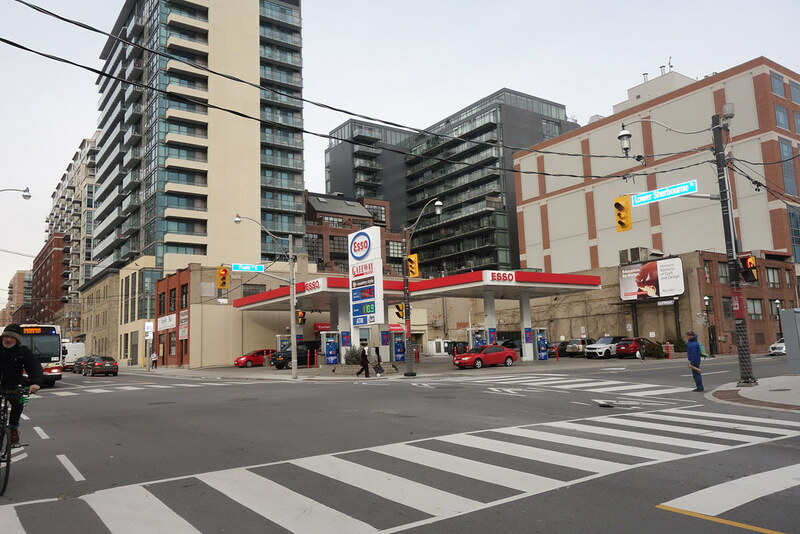 The Esso station will be the next to go, and because it costs a lot of money to buy out fuel stations and remove the soil entirely, you can sure the next structure that rises on this corner (the N.E. corner) of Front and Sherbourne will be gigantic. 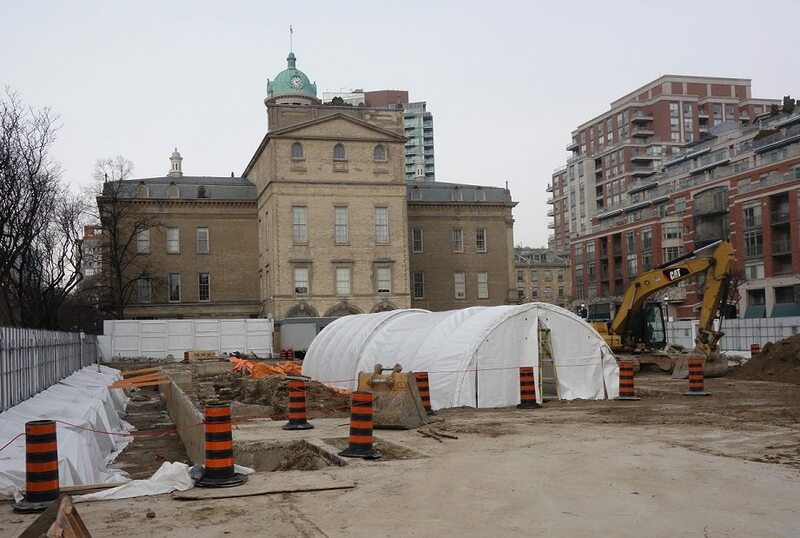 Look what’s happening across the street at 177 Front St east, the southeast corner of Front and Sherbourne St. The businesses are gone – the buildings there today are all boarded up and await demolition. The property will be leveled and excavated for underground parking before rising again in the shape of a massive 38 story complex with over 1500 units. Time and Space condominiums is building on this address in 2017.